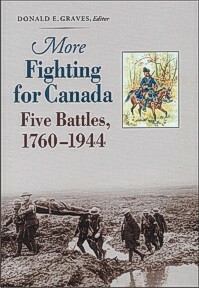 More Fighting for Canada is the second volume of the "Fighting for Canada" series and contains five detailed accounts of battles fought in Canada or by Canadian soldiers overseas. Included are the battle of Sillery (1760), the last major action of the Seven Years War in America and a French victory; Cut Knife Hill, 1885, fought between the Canadian militia and the aboriginal peoples; Paardeberg, 1900, Canada's first major overseas action; Iwuy, 1918, the last cavalry Canadian cavalry charge; and the Melfa River, 1944, a desperately-fought river crossing that resulted in the award of the Victoria Cross. Written by professional soldiers (all being combat arms veterans) and edited and with an introduction by Donald E. Graves, More Fighting for Canada concentrates on the tactical level of war, the "sharp end" where the fighting takes place. Details: Hardcover and quality softcover, 7" x 10", 362 pages, more than 120 maps and illustrations, detailed appendices with orders of battle, source notes and index. "This is the second in a series of in-depth battle reconstructions edited by Donald Graves. Each presentation uses the same formula: a detailed tactical account of the battle followed by a description of the battlefield as it appears today. Very helpful Orders of Battle for all participants appear as appendixes. Because the disparate battles described span two centuries, Graves provides skeletal "interlude" history to fill in the chronological gaps. The authors are all serving or former army officers, a fact reflected in the narrative style. ……The commonality in these accounts is perhaps that all battles are inherently confusing, battlefield decision-making is extremely difficult, and the nature of the terrain powerfully influences all engagements' occurrences and outcomes. The numerous maps, diagrams, and illustrations by Christopher Johnson are simply terrific. Although it does not always introduce new information, the book remains a welcome addition to the literature. " "[This book] is aptly named because of its unapologetic focus on the tactical level of war, the actual fighting of battles. In a more or less direct challenge to the critics of the so-called "trumpet and drum" writing of history, Graves has set out his agenda very clearly. This is not soft social history; smoke fills the pages. ...... The two volumes in this series hold a key place in contemporary Canadian military historiography. Indeed they are probably unique in their unabashed focus on the battlefield in the wake of the many years of criticism by social history advocates. These books have a central role in the fight for contemporary Canadian historical writing of battle studies. It can only be hoped that a third volume is already in the works. "